Copper has been in use by civilization for over 10,000 years and has been recycled since early times. Because it does not degrade during recycling, copper in use today could have been first fabricated into objects thousands of years ago. Copper is highly prized by scrap metal collectors and scrap metal recycling businesses. The nonferrous metal is the best conductor of electricity except for silver. That electrical and thermal conductivity, along with properties of high ductility and malleability make it one of the most demanded metals by industry, eclipsed only by iron and aluminum. Copper has been used and recycled by people for over 10,000 years, with a pendant dated to approximately 87000 BC having been found in what is now northern Iraq. Around 8000 B.C., copper emerged as a substitute for stone, and by 4000 B.C., Egyptians were heating and casting copper into shapes. Around 3500 B.C., the technology of copper processing continued to grow as the process of smelting ores was discovered, harkening the introduction of the Bronze Age. Copper is an essential trace element which is necessary for the plant and animal health. Moderate excess exposure to copper is not associated with health risks. As with other metals, there are significant environmental benefits to the recycling of copper. These include solid waste diversion, reduced energy requirements for processing, and natural resource conservation. For example, the energy requirements of recycled copper are as much as 85 to 90 percent less than the processing of new copper from virgin ore. In terms of conservation, copper is a non-renewable resource, although only 12 percent of known reserves have been consumed. Known U.S. reserves of copper are thought to total 1.6 billion metric tons, with production concentrated in Arizona, Utah, New Mexico, Nevada, and Montana. About 99 percent of domestic production is generated from 20 mines. An emerging environmental challenge for copper is its use in the ever-increasing production of electrical products that still experience low recycling rates. This trend is changing for the better, however, through electronics recycling initiatives. Ranking immediately behind Chile in copper production, the United States is largely self-sufficient in copper supply. The U.S. produces roughly 8 percent of the world’s copper generation. Almost half of U.S. copper output comes from recycled material, however. In 2010, U.S. recyclers processed 1.8 million metric tons of copper for domestic use and export, second only to aluminum among nonferrous metals, which saw 4.6 million tonnes recycled. 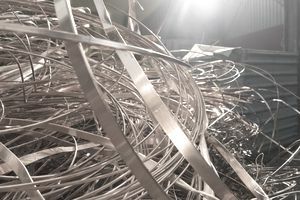 Slightly over one-half or recycled copper scrap is new scrap recovery including chips and machine turnings, with the rest being old post-consumer scraps such as electrical cable, old radiators, and plumbing tube. The Copper Development Association notes that were copper is combined with other materials such as tin or solder, it can be more economical to utilize it in applications where tin or lead is required, such as gunmetals or bronzes, rather than to remove these metals through refining. A scrap of this type commands a lower price than uncontaminated copper. Where contamination has extended "beyond acceptable limits," to quote the Copper Development Association, re-refining is necessary to recover pure copper.